Our company is a leading service provider of reliable garage door repairs and replacement. But did you know we're also the best gate repair and installation service provider in town? We know how important it is to have a reliable entry system, as it keeps our homes and businesses safe from potential intruders. Our team strives to make sure our customers are always satisfied by providing high-quality garage door and gate repair services. We understand the importance of having a functional gate. That's why our company carries a vast array of top quality replacement parts. Whichever component starts acting up, however large or small it is, we can replace it with a substitute component that will do its job just as well if not better. We can install new entry systems for your home and/or business. We can install every type of gate, from swing to sliding and everything in between. We are proficient in installing every model from every top brand of the industry, as well as the more obscure manufacturers. Our technicians adhere to guidelines and comply with the highest safe installation standards. Our experts are always available for consultation as well, and we can help you choose the perfect type of gate for your home or business. We provide a full system diagnostic as well as a routine maintenance service to our commercial and residential customers. This service can be scheduled according to your needs and preference, be it monthly, yearly, or simply occasionally. Our professional technicians will perform a full examination of your gate system and will quickly replace any part that isn't doing its job properly. With our maintenance service, you will be able to rest easy knowing that the condition of your gate is optimal. 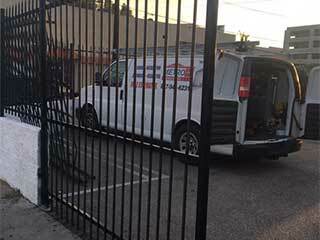 When it comes to gate repair, installation and replacement, you can rely on our specialized team. We aim to meet and even exceed your expectations, so be sure to get in touch with our experts at Garage Door Repair Irvine for any gate related assistance that you need. Call us today to learn more about what we can do for you. Garage doors are one of the most important parts of your home, and as such, you need to treat it with utmost care. No matter what kind of issue you might find yourself experiencing with your door, we are just one phone call away. And because we're a local company, we guarantee we'll be there for you on the same day. Thank you for choosing our company! Feel free to browse our website for more information in the meantime. Our team at Garage Door Repair Irvine is at your service any time!